The best cookies ever + a great giveaway! This is a good Wednesday. Loving food is a weird thing. I get giddy over things like really great cinnamon or an incredible salt. So when I had the opportunity to share with you guys about The Spice House, it was a no-brainer. Perusing their website is like letting a kid loose in a candy store. The Spice House opened its doors back in 1957, and today has both a robust online business as well as 5 locations throughout Chicago & Milwaukee. They carry over 600 products from at least 50 different countries, including pure spices and herbs, spice blends, salts, and extracts and have caught the admiration of many home cooks across the country as well as some heavy hitters in the food world, including Alton Brown (who actually has special blends made for him) & Julia Child, who proclaimed The Spice House a "national treasure." We had cinnamon that came from Vietnam, a long log, real thick, and as hard as a baseball bat! The trade doors had just opened from Vietnam when she visited, and we couldn't wait to show her this bark, and then give her a taste in powder form. Julia took the bark right out of my hand and took a giant bite right out of it! My whole family was there and we all collectively sucked in our breath, and asked, "Do you want to spit that out?" But she kept right on chewing and chewing and chewing, and 10 minutes later she had chewed it enough to swallow it. Julia was just so gracious, and she said something like, "Oh my dear, you're absolutely right, this is a delightful cinnamon, thank you for sharing this with me!" She signed the rest of that bark and today that bark is one of Patty’s prized possessions. Tom & Patty Erd took over Patty’s parents business back in 1993 and have built The Spice House into a resource for incredible spices and seasonings, as fresh as you can get them at an affordable price. They scour the world for the best ingredients and spices, and they grind and blend their spices and seasonings in small batches right in their stores in order to offer the freshest possible product. Many of their spices come in pretty glass jars, however you can also order many varieties in bags (as well as in salt-free versions). I'm personally impressed with their pricing, but also their crazy fast shipping. Their gift boxes are both gorgeous and well thought out. Take a few minutes and peruse their offerings! These cookies are inspired by the most incredible chocolate I had when we were in Vancouver. With the nutty flavor from brown butter and sunflower seeds and the salty topping from The Spice House's fabulous grey sea salt, these are just about as good as it gets. Miles declared these the best cookies I have ever made... win! Melt 8 tablespoons of butter in a medium skillet over medium heat, swirling it in the pan. It will become foamy as it cooks and make a crackling noise. Continue to swirl as the butter starts to smell nutty and brown bits form at the bottom of the pan. Once the bits are amber, remove the butter from the burner and pour into a small bowl (including the brown bits... the best part!) to cool for about 20 minutes. In the bowl of a stand mixer, beat the remaining 1/2 cup butter with the brown sugar for 3-5 minutes, until smooth and fluffy. Beat in the vanilla extract and molasses. Pour the cooled brown butter into the bowl, along with the granulated sugar. Beat for 2 minutes, until smooth; the mixture will be light and fluffy. Add the egg and egg yolk, and beat for 1 more minute. Add the flour, salt, and baking soda, beating on low speed just until everything is incorporated. Remove the bowl from the stand mixer and use a spatula to fold in the dark chocolate and sunflower seeds. Cover the bowl with plastic wrap and refrigerate for at least 30 minutes or up to overnight. About 15 minutes before you’re ready to begin baking, preheat your oven to 350°F. Scoop the dough in 2 tablespoon-sized balls onto the prepared baking sheets. Leave about 2 inches between the cookies. Sprinkle the cookies with grey sea salt. Bake the cookies for 13-15 minutes, until they’re golden brown. Remove them from the oven, and allow them to rest on the baking sheet for at least 5 minutes before transferring them to a wire rack to cool. To help you make some cookies (and because they're awesome), The Spice House is offering two seriously great giveaways! 1st Prize - $250.00 in spices, which includes Grill & BBQ Deluxe Gift Box Set, Bakers Spices Gift Box Set, Vanilla Bean Sugar, Chicago Old Town Premium Sugar, Vulcan's Fire Salt, Chai Spices with Vanilla, Pumpkin Pie Spice, Dutched Cocoa Powder, Aleppo Pepper, AND a $100.00 gift card to The Spice House to find your favorites not on this list or try some new ones! 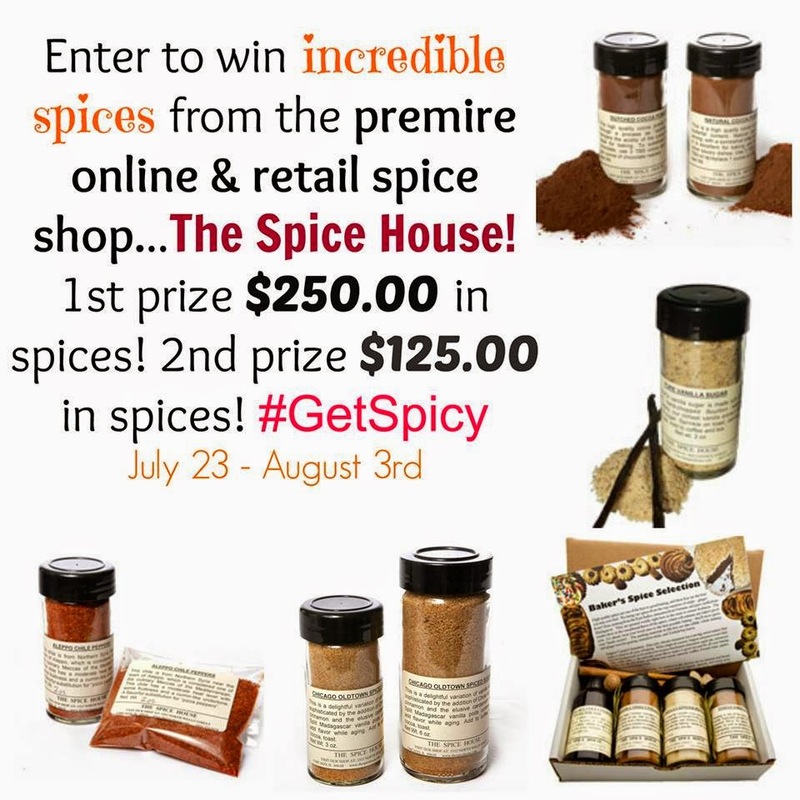 2nd Prize - The Signature Selection Gift Box Set, Chicago Old Town Premium Sugar, Fancy Onion Salt, Fancy Garlic Salt, Vanilla Bean Sugar, Tellicherry Black Peppercorns and a $50.00 gift card to The Spice House to find your favorites not on this list or try some new ones! Enter by simply using the Rafflecopter below. Good luck! Check out the other fabulous recipes inspired by The Spice House from some of my food blogging friends! Jamaican Jerk Chicken Pizza by We’re Parents!? Disclosure: I was given a gift card to order spices as compensation for this post, however as always all thoughts and opinions are my own. I love cumin and ginger, I know I need to work with other spices too but I love the flavor of these spices. I really love garlic and think your recipe looks great! Dark chocolate is my favorite and I've been sprinkling salt on my cookies as of lately too. The sunflower seeds are an interesting addition. Oh goodness. I am feeling the need to go bake right this minute. These sounds delicious and the salt puts them over the top-I love good salt. What a fantastic recipe! Sunflower seeds are genius.. I've totally been The Spice House in Milwaukee! Such a cute place! Also, LOVING the cookies ma'am! I like cinnamon and I like the recipe for the coookies. These cookies sound delicious!! I love cinnamon spice and a good vanilla! OMG seriously! These look AMAZING! WANT! I have just begun to use more spices this year and it's changed my cooking so much! I still can't live without my stalwart black pepper but I also always reach for the cayenne and paprika. Oh yum! These look incredible! HI Marie, these cookies look very special, love the addition of the salt. Their gift boxes ARE cute! I go crazy for spices also! And somehow I have seen grey salt around lately in a lot of recipes. Must mean it's the new coolest thing. I love a touch of salt with my cookies and these sound awesome! I love cinnamon and go through a lot of it. This recipe sounds wonderful! I love dark chocolate and sea salt together, SOO good! I love the addition of sunflower seeds! Frankly, it should be mandatory that all chocolate chip cookies be salted. I don't think I can go back to plain ones again! ginger is my fave spice...on another note, super intrigued by the molasses in this recipe! Oh these look so amazing! I can not wait to make them. I love sea salt...everything about it!